Early in September, Vanessa Ruiz, a news anchor at 12News Arizona, caused a mini-controversy with the way she pronounces Spanish words on air. Ruiz is a native speaker of Spanish, and viewers were getting upset that she rolled her “r” when saying words of Spanish origin. She defended herself by claiming that she was only pronouncing the words “the way they were meant to be said”, although not everyone appreciated this response. This is part of a series on the International Phonetic Alphabet. The series so far is over here. You can get your copy of the IPA here. You’ll probably want one to follow along. 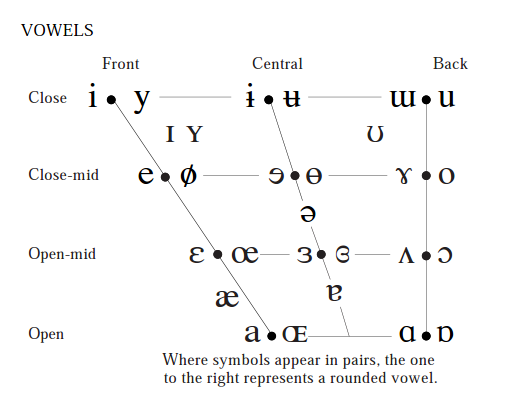 In this post, I’ll cover the vowel chart. The IPA divides up sounds based on their articulations, and vowels and consonants have fundamentally different kinds of articulation. In particular, consonants are sounds produced with obstruction in the vocal tract, while vowels are sound produced without any obstruction. How many words could English have? How many words are there in English? A popular method for counting words in a language is to use the total number in a dictionary (or some other corpus). But counting words this way doesn’t tell us anything very interesting about “English”, because not every speaker of English knows every word in the dictionary. For example, you might know the word beech refers to a tree, but not know how to identify one in the woods. You might know that some governments are jingoistic, but not know which ones or why. Maybe you confuse yams and sweet potatoes all the time. So does beech count as “part of English” if not every speaker of English knows it, uses it, or understands it? The words you know depend on things like education, job, dialect, how much you read, where you grew up, your hobbies, how much you’ve traveled and so on.